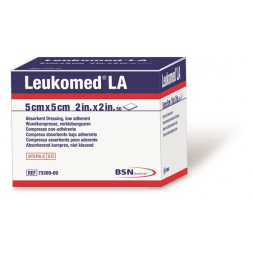 Leukomed LA consists of a low adherent wound dressing designed for low to moderate exudate management. 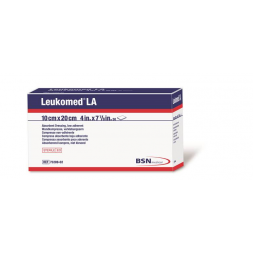 Leukomed LA provides reliable, non-stick absorption suitable for surgical wounds, clean sutured wounds, abrasions and minor burns. The soft absorbent wound pad reduces the risk of skin macerations, blistering and ensures atraumatic dressing changes enabling high wearing comfort for the patient. With excellent strike through, Leukomed LA requires fewer dressing changes and reduced trauma to the healing tissue. With a wound contact layer on both sides of the dressing, it allows for precise placement and less confusion upon application. 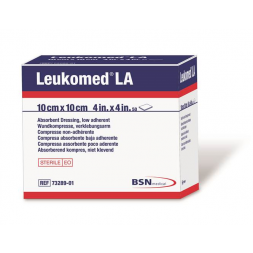 Leukomed LA is suitable for low to moderate exuding wounds including: post-operative wounds, clean and sutured wounds, abrasions, lacerations and minor burns.